Pretty Good Solitaire is the best way to play Spider. 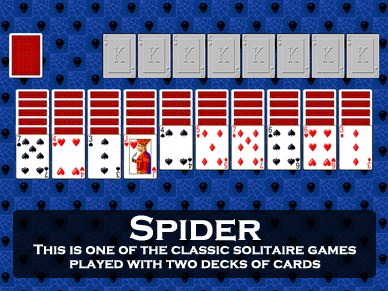 It contains Spider and more than 60 other solitaire games similar to Spider, such as Spider One Suit, Spider Two Suits, Miss Milligan, Rouge et Noir, Scorpion, and many, many more. Most Popular Solitaire is Spider the way it ought to be. Play Spider, Spider One Suit, Spider Two Suits, Scorpion, and more. Undo any move or all your moves or play in Climb Mode from game #1 on up. Action Solitaire is Spider like an arcade game. Play Spider in timed rounds for a cumulative score. Includes many other exciting timed solitaire games, such as Triple Peaks and Get 11. For Windows 10, Windows 7, or Windows 8/8.1. Pretty Good MahJongg is Spider with MahJongg tiles. Play many exciting solitaire games with MahJongg tiles, or play the classic tile matching solitaire MahJongg game. For Windows 10, Windows 7, or Windows 8/8.1 or macOS. This site is copyright ©2001-2017 Goodsol Development Inc. All Rights Reserved.